December ushers in numerous celebrations and is the month of gift-giving and gratitude. For those born in this festive month, December also signifies an association with a trio of symbolic gemstones: Tanzanite, Zircon and Turquoise. Displaying these unique stones to create a December birthstone necklace is a perfect way to showcase one’s birth month, to symbolize a child’s birth or when honoring a relationship status through the incorporation of a partner’s birth stone. While each of these three gemstones is associated with December, you don’t have to use all three when designing a December birthstone necklace. You can pick one or two…or you can embrace the complete trilogy of gems. To choose your perfect December stone(s) for a unique December birthstone necklace, delve deeper into the history, meaning and mysticism of each gem. The name Tanzanite wasbestowed on this blue gem from the jeweler Tiffany & Co. Tanzanite is a mineral called zoisite, but Tiffany’s wanted a name that was a bit more appealing. The company decided on Tanzanite as the mineral was mined in Tanzania, Africa. Tanzanite’s name eventually stuck, and now this gem’s blue appeal is known worldwide. Buyers should know that naturally blue Tanzanite is valuable, and most Tanzanite is heat-treated to gain the blue color. Heat-treatment should always be disclosed by jewelers, and buyers may still purchase natural blue Tanzanite. While this gem is suitable for everyday wear, it isn’t quite as strong as a sapphire. On the Mohs hardness scale, Tanzanite’s strength rates between a 6 or a 7,according to the Gemological Institute of America (GIA). The GIA also warns that the stone may be prone to breakage if hit. According to The Crystal Vault, Tanzanite may help boost the immune system and also is known for aiding in stress relief and tension. Zircon is NOT cubic zirconia (aka the well-known lab created diamond impersonator)! Although the GIA notes that colorless zircon displays similar fire as a diamond—this is likely why it’s confused with the cubic zirconia—zircon is naturally occurring and one of the oldest minerals on Earth (4.4 billion years!). But zircon isn’t just a clear diamond-adjacent gem; this mineral comes in many colors, adding to its popularity. December birthdays may choose yellow, blue, red and several other hues of zircon. The GIA notes that to maximize the stone’s brilliance, buyers shouldselect round or oval shaped zircon. HealingCrystals.com attributes zircon to certain physical benefits like helping “with muscle and bone disorders,” insomnia, and allergies. However, the site also notes that zircon may help protect against liars and bring calming benefits to those who have experienced a trauma. However, many other cultures have embraced turquoise throughout the millennia. The GIA states thatturquoise was used by the ancient Egyptians and the stone also serves as the symbolic gem of Tibet. Turquoise is a fairly plentiful and inexpensive stone, but the gem isn’t particularly hard. The stone, according to the GIA, ranks between a 5 and 6 on the Mohs Scale. So, yes, this stone may break with a hard hit. All three stones representing December pair beautifully together to create a symbolic December birthstone necklace…and also shine boldly when used solo. Choose silver settings for these birthstones, however, as the blue or clear hues of the gems look best when set in cool-hued settings. 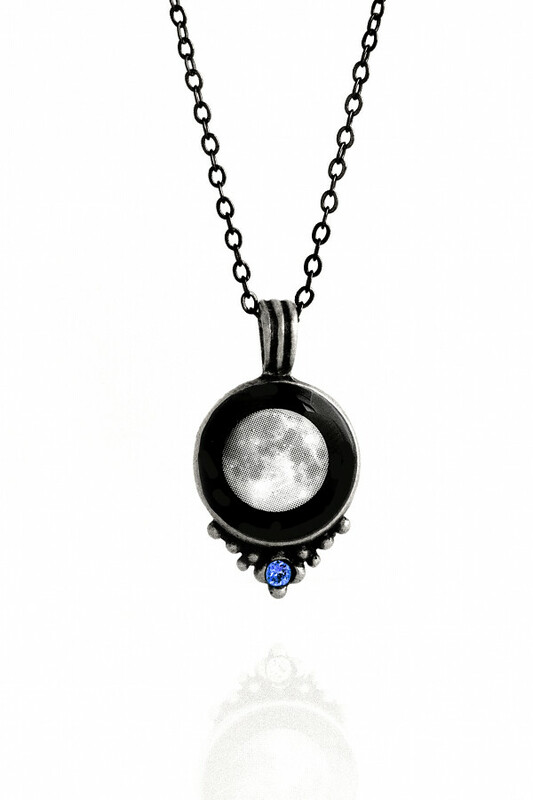 If you’re designing a birthstone necklace incorporating other charms (like moon phases), you may want to choose one stone that best suits your personality. If you do wish to incorporate all three, place a clear zircon between blue Tanzanite and turquoise to break up the blue…and create fire. All three stones hold different meanings for December birthday celebrants. While you may choose to include all three symbolic stones into a December birthstone necklace, perhaps not each of the three stones holds personal meaning. Find the gem that fits your story to design the most symbolic necklace for you.